Perfect for combination and oily skin, this gel cream is a lightweight formula that balances the skin’s oil production. It’s packed with minerals like Active Seed Complex with chia seeds and mattifying powders to deliver nutrients to skin. I recommend this product to anyone who has oily skin. The product is amazing I use it daily as primer it keeps shine at bay all day long and leaves my makeup flawless and radiant. The product is reasonable and incredible. The transition from winter to spring has not been easy on my skin. 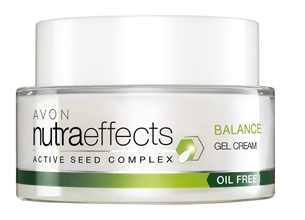 I have combination skin, so it is generally dryer in the winter months and oilier in warmer seasons.I purchased the Avon NutraEffects Balance Gel Cream from my local Avon representative in hopes to restore balance. The formula is lightweight, perfect as a base for my primer and foundation. The gel has the fresh sent of cucumber which love. I have noticed my skin being more matte since using this product. The only draw back is the lack of SPF. I tend to use foundation containing SPF but on no make-up days, I will not be reaching for this one first. I do recommend this product as it delivers and at an affordable price point too!